Serving all of Austin, TX, including The City of Austin, Georgetown, San Marcos, Pflugerville, Cedar Park, Leander, Waco, Fredericksburg, Round Rock and the surrounding counties. Celebrity Greens Austin is the Authorized Dealer, Designer and Installer of Artificial Grass, Artificial Turf and Artificial Putting Greens in the city of Austin, and the surrounding counties. 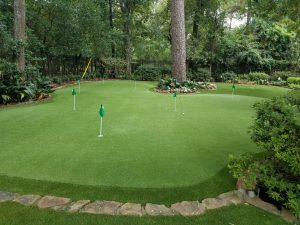 Celebrity Greens Austin is experienced in projects ranging from residential landscapes, playgrounds, commercial applications, amazing synthetic grass installations to signature putting greens. With the ability to handle any size project, the Celebrity Green’s Austin team will also work with homeowners to design their entire landscape. If you have a unique landscape project that involves synthetic turf or artificial grass and you want the best quality installed by the most experienced team of designers and installers, with the attention to detail that suggests you are their most important customer, then you have come to the right place. Celebrity Greens Austin offers complete landscaping services, and we are proud to offer products that require very low-maintenance while remaining lush and green through every season and all weather conditions. Contact us today at ‭(512) 568-2922‬ and let us work with you on Artificial Turf Lawn, Playground, Sports Surface or Putting Green.